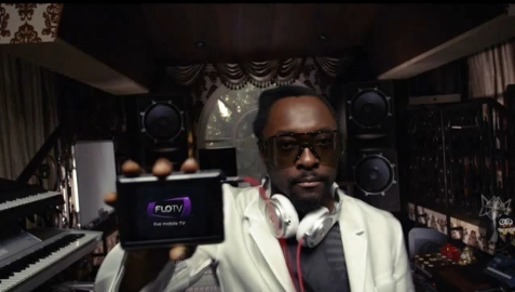 FloTV, Qualcomm‘s mobile television service, has a range of television advertisements to be shown during and around the 2010 Super Bowl game. CBS sports commentators Jim Nantz and James Brown appear in 30 second commercials, while The Who’s collaboration with will.i.am and Slash in a remix of their track My Generation provides viewers with a connection with Oxfam’s Haiti Earthquake Response Fund. CBS sports commentator Jim Nantz will throw a spotlight on how FloTV’s “personal television” can help a guy stay connected to a favorite sports match even while he’s shopping, offers a humorous play-by-play of a couple on a shopping spree. The spot also will feature Nantz delivering a highly memorable and amusing tagline that’s sure to enter the pop-culture lexicon. CBS Sports commentator James Brown helps a family on a road trip find peace by introducing them to the FLO TV Auto Entertainment service. Will.i.am’s remix of The Who’s “My Generation” as done by will.i.am provides the musical backdrop for a compilation of historical events and shared experiences that have united generations of television viewers. The full-length single features guitar legend Slash. will.i.ams fresh twist on the lyrics underscores the ways in which different generations are affected by technology and how viewers today consume content on the go. The song will be available for download on Amazon.com, dipdive.com and TheWho.com, with 100 percent of the proceeds benefitting Oxfam Americas Haiti Earthquake Response Fund. Agency: Magner Sanborn and Agency 3.0 and Membrain.